Turquoise is a full-displacement yacht built by the famous Turkish yard Turquoise and designed by Dubois Naval Architects. 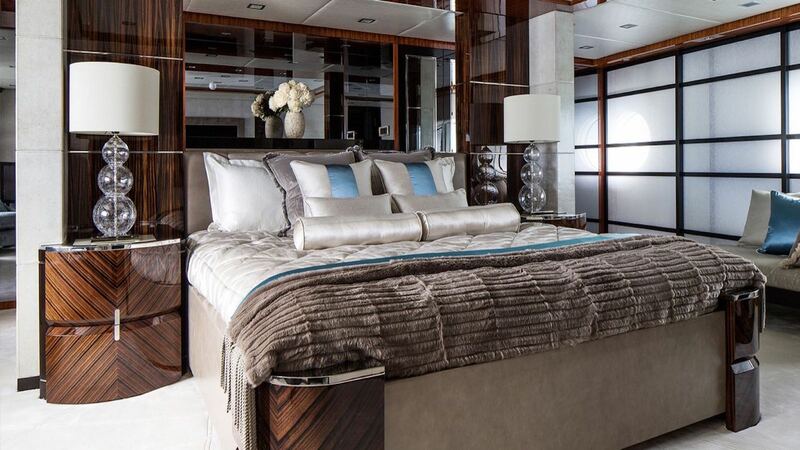 The yacht underwent a multi-million-dollar refit in 2014 with a full new interior by H2 Yacht Design. She is a light-filled spacious vessel with the true ‘wow factor’. Her stunningly elegant, neutral interior has a palette of silver, cream, white and turquoise and features Wenge wood accents, organic wall coverings and luxurious soft furnishings. She has been carefully designed to be a perfect entertainers yacht, ideal for socializing, with many different spaces for relaxing and dining on every deck. A truly Luxury Yacht Rental! Boomswim (protected pool) with trampoline and waterslide (slide positioned on the water, not from the vessel). 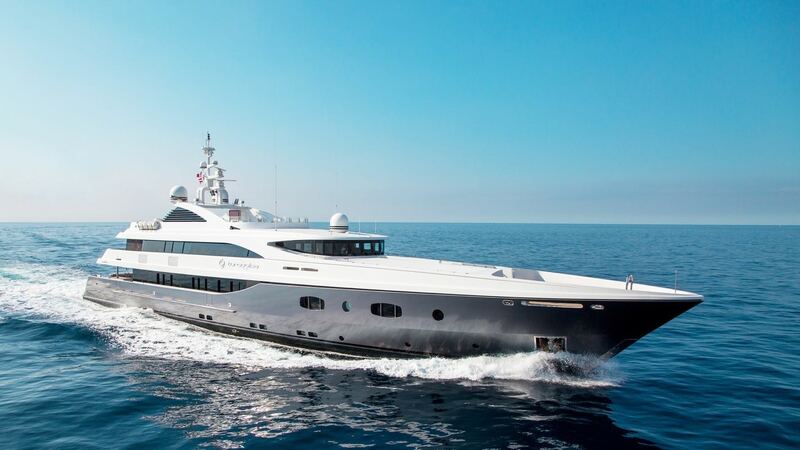 Turquoise is able to accommodate twelve guests in six generous staterooms including an impressive full beam master and VIP on the main deck, three doubles and one twin. All are ensuite and beautifully styled to create the perfect haven for guests to retreat to during their time on board. Thirteen crew, who specialize in creating exceptional charters, are on hand to provide guests with a yacht charter vacation to remember. The entire yacht has been designed around the charter experience, with an exceptional food and dining programm in place and multiple dining spaces – both inside and outside, formal and informal – to choose from. Outdoor living set ups have been maximized, with spaces including the huge sun deck featuring a bar, spa pool, BBQ, gym equipment and sunloungers. The main aft deck is a popular spot that has been styled around a Nikki beach feel, with modular Paolo Lenti furniture that can be rearranged into configurations including one huge seating area, sheer curtains for privacy and an outdoor cinema set up. An exciting array of water toys and tenders are on board, including a 36′ Blackwater Sport 2014 tender with three Mercury 300hp engines, a 7.5m Novurania custom tender, Waverunners, Seabobs, waterskis, wakeboards and more. A dropdown transom creates a Beach Club base for enjoying water activities. Boasting exceptional cruising comfort, thanks to zero speed stabilisers, and large volumes, Turquoise is perfect for longer and shorter charter itineraries alike. Cruising at 12 knots with a maximum speed of 14 knots she has a long range of 5,500nm. The luxurious Master Stateroom is located on the main deck and spans the entire width of the boat. TURQUOISE embodies a modern interpretation of art deco. The sun deck, laid out for sunbathing with a large spa pool and plush sunpads, also features a stylish bar, barbecue and dining area. This is the most accommodating place on the yacht and ideal for spending the afternoon while at anchor. 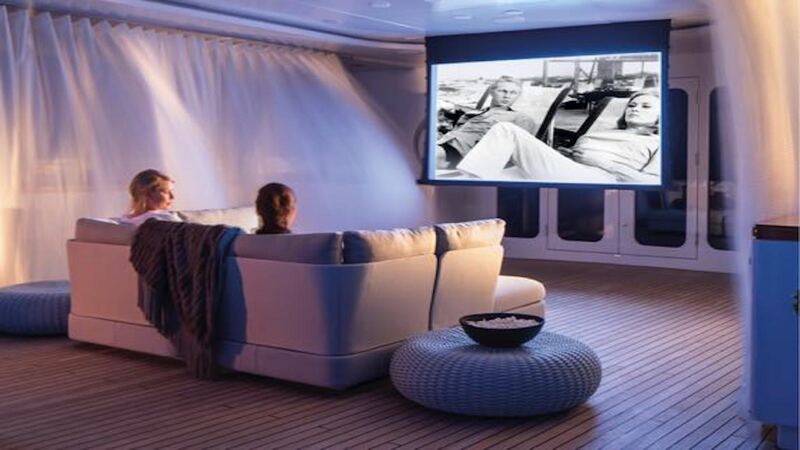 Sheer curtains pull across to create privacy in the outdoor cinema on the main aft deck downstairs.